Available Colors: Black with Red, Blue, Gray or Lime Green. Shipping Weight: Poly Bag, 25 per carton @ 40 lbs. 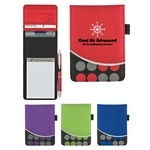 Customized 8-1/2" x 11" Expanding File Organizer (Item #HT-6475) is Promotional with a Free Artwork Imprint. 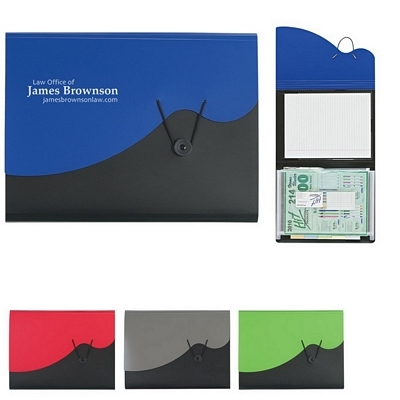 Promotional Padfolios like our Personalized 8-1/2" x 11" Expanding File Organizer are decorated with your logo with no setup fees. Customized NonWoven Bubble Jotter Pad Item #HT-6520 is Promotional with your business logo for advertising to clients. Customized NonWoven Bubble Jotter Pad and other Promotional Jotter Pads are decorated with No Setup Fees. Customized NonWoven 8-1/2" x 11" Bubble Padfolio Item #HT-6521 is Promotional with your business logo for advertising to clients. 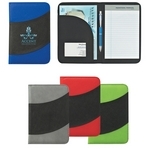 Customized NonWoven 8-1/2" x 11" Bubble Padfolio and other Promotional Padfolios are decorated with No Setup Fees. Customized NonWoven 5" x 7" Bubble Padfolio Item #HT-6527 is Promotional with your business logo for advertising to clients. 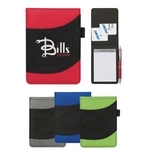 Customized NonWoven 5" x 7" Bubble Padfolio and other Promotional Junior Padfolios are decorated with No Setup Fees. Customized NonWoven Polk-A-Dot Jotter Pad Item #HT-6540 is Promotional with your business logo for advertising to clients. 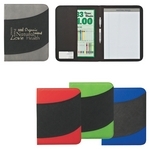 Customized NonWoven Polk-A-Dot Jotter Pad and other Promotional Jotter Pads are decorated with No Setup Fees.